Meiho University has intriguing history which has brought us to where we are today. Meiho University was the first private nursing junior college in Taiwan, but the University is much more than that today. Meiho University was established in 1966 upon the approval of the Ministry of Education. The original name was Meiho Junior College of Nursing, and it was a five-year program with all students majoring in Nursing. In 1984, the two-year program was established. In 1990, the Department of Finance and Tax was established, a two-year evening program was set up, and the school changed its name to Meiho Junior College of Nursing and Management. In 1999, the school became Meiho Institute of Technology (MIT), and it also had junior college programs. Most recently, in 2010, MIT was approved to be renamed Meiho University (MU). Meiho started with only one department (Nursing Department) with approximately 300 students. With the dedication and hard-working of Board Directors, Presidents, and staff through the years, nowadays MU has 3 colleges, including College of Health and Nursing, College of Business and Management, and College of Human Ecology, with a total of 16 departments and five graduate institutes. There are nearly 9,000 students including day programs, extension programs, continuing education programs, on-job evening and weekend programs; and there are about 430 faculty members in the school. 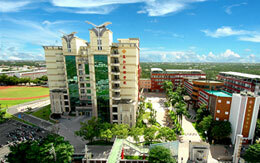 Over the years, Meiho University has expanded the campus, upgraded equipment, and promoted service learning programs. The school also seeks ways for students to gain an extended worldview, offering students and faculty exchange programs to create international learning environments and multi-cultural opportunities. Furthermore, the school also recruits foreign students and faculty to promote internationalization, and offers students a variety of learning experiences. Welcome to Meiho University. Meiho University, established in 1966 as one of the popular nursing schools, for nearly 50 years of development, grew from an institute with focus on nursing profession to a university nurturing students with various professions, including nursing, health care, science and technology, and finance. Meiho University is now providing a wide range of majors in health care and nursing, business and management, human ecology and related specialties. Our educational goal stresses the continuum from academic learning to clinical and industrial practice. During the past years, Meiho University continued to flourish the tight collaboration and partnership with renowned institutions and companies, and provide students opportunities for internship to consolidate their learning into practice. We also continue to put effort in promoting international academic collaboration and industrial cooperation, providing more opportunities in practice for students toward internationalization. In addition to academic curriculum, we also encourage students to participate in wide variety of extracurricular activities, such as sports, nation-wide and international contests, social activities and community service. We encourage students to participate in diverse curriculums, and consider the diversification of excellence across all professions a priority. We aim to nourish students to become talented, well-educated, and with vision. We value students’ learning, and encourage teachers to motivate students to actively participate in their learning. The mission of Meiho University is to nurture students with professional skills, provide high-quality human resources specializing in nursing, health care, science and technology, and finance. We foster students to continue their academic learning into clinical and industrial practice. Our vision is to promote adaptive teaching, emphasize academic research innovation and practical learning. Meiho University shall promote close collaboration with reputed institutes, schools and corporations, so as to provide students opportunities for clinical practice and experience sharing.